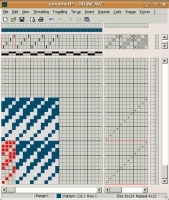 DB-WEAVE is a software to help you design dobby loom patterns. 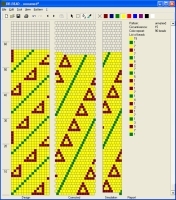 It supports weaving such patterns on a variety of supported loom types (e.g. ARM Patronic). There are virtually no limits on size and complexity of the patterns. DB-WEAVE is powerful yet intuitively usable. It runs natively on Microsoft Windows and can be run without problems on Linux using Wine or on the Mac using a Windows VM software (e.g. Parallels Desktop). DB-WEAVE is free to download and use (freeware). jbead and DB-BEAD are programs to help you design bead crochet ropes. This technique is described in the book 'Bead Crochet Ropes' by Judith Bertoglio-Giffin. jbead is the successor program of DB-BEAD. It is written in Java and runs on Windows, Mac OS X and Linux systems. It is open-source using the GPLv3 license and can be freely downloaded and used.